We are your locally owned family-friendly neighborhood comic store. 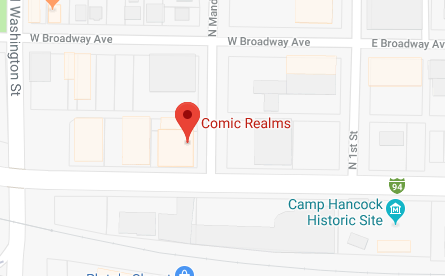 Located in downtown Bismarck we offer a huge selection of all the latest comic releases and an extensive back issue selection, as well as graphic novels, supplies, and collectibles. We offer a full line of services including pull lists (in-store or by-mail), grading, restorative, and appraisals. Come down, enter our realm, and become part of our family.